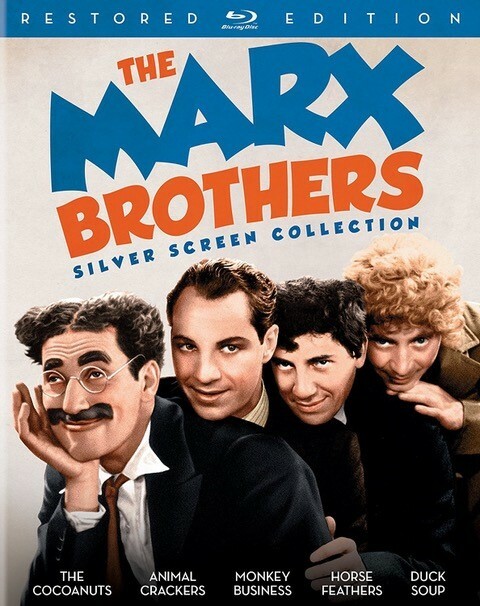 This essay was first published in the 2016 Universal Pictures Home Entertainment release, The Marx Brothers Silver Screen Collection (Restored Blu-ray Edition.) 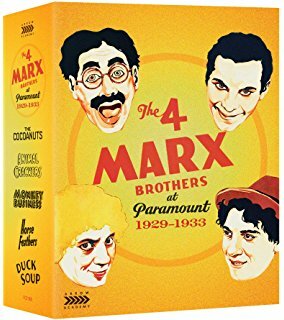 It also appears in the 2017 UK edition of the release, The 4 Marx Brothers at Paramount. While the Marx Brothers were onstage performing The Cocoanuts at the Lyceum Theatre in Rochester, New York, on October 6, 1927, history was being made 330 miles away in New York City. That evening at Warners’ Theatre in Times Square, the premiere of the Warner Bros. talking motion picture adaptation of the hit Broadway play, The Jazz Singer, starring Al Jolson, redefined the movie business overnight. The silent film as an art form essentially died that evening. It was a slow death, as the other studios were not all quick to adapt. But the studios that did embrace sound movies quickly began to look for actors who could speak. The Four Marx Brothers could—and three of them would. Sound films had been in development almost since the invention of motion pictures, and it was apparent by 1925 that it was just a matter of time before one of the many systems finally worked well enough to put the idea over. By that point the Marx Brothers – individually and collectively – had been working on vaudeville and Broadway stages for twenty years. Groucho – still Julius at the time – made his show business debut in the summer of 1905. His mother Minnie, soon to be a legendary stage mother, was sufficiently inspired by her son’s early success to push the rest of her considerable brood onto the stage. Milton and Adolph – later known as Gummo and Harpo – followed Julius in 1907 and 1908. The family act was solidified when Minnie’s oldest son Leonard – better known as Chico – was added to the fold in 1912. Leonard had been working as a piano player and in a few undistinguished vaudeville acts of his own. Within a couple of years the Four Marx Brothers were among the most popular and successful acts in vaudeville. They didn’t miss a beat when Milton left in 1918, preferring World War I to life on America’s vaudeville stages. Minnie informed her youngest, Herbert that he was now part of the act and Zeppo replaced Gummo as the fourth Marx Brother. It never occurred to Herbert that he had a choice. But he probably didn’t. Minnie’s boys were all quick to realize that she was like a force of nature. The act was her dream and they were in no position to change her plan. Their big success in vaudeville was always a little tenuous. The Marx Brothers on more than one occasion upset the moguls who ran the business. Blacklisting was a common tactic in the monopolistic world of vaudeville. When the Marx Brothers were banished for their latest transgression in 1922, they simply moved on to bigger success at something else. The legitimate theater was the next step and after a year on the road, the hit musical I’ll Say She Is debuted on Broadway in 1924. The Cocoanuts followed in 1925, as did Animal Crackers in 1928. The Four Marx Brothers responded to being unceremoniously kicked out of vaudeville by becoming the toast of Broadway. During the Broadway run of Animal Crackers, they agreed to film The Cocoanuts. On the morning of February 4, 1929, production began at Paramount’s Astoria studio. That evening at 8:30 the Marx Brothers were onstage in Animal Crackers. In his memoirs writer Morrie Ryskind wrote: “After spending all day on the set filming The Cocoanuts, they would take a cab back into the city for the evening performance of Animal Crackers. It was a brutal schedule to maintain, and after a few weeks of it the boys were so worn down that it was not unusual for swatches of dialogue from The Cocoanuts to make their way into the evening performance of Animal Crackers.” Ryskind doesn’t mention the opposite scenario, but there remains evidence in the film version of The Cocoanuts that they occasionally slipped into Animal Crackers during the filming. In the “Why a Duck?” scene Groucho almost refers to Chico as Ravelli—the name of his character in Animal Crackers—but stops himself after one syllable, thus saving the long take. 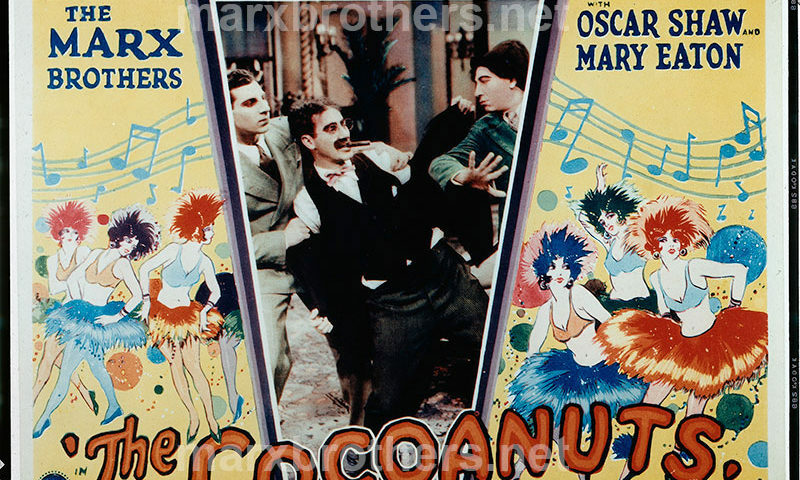 As one of the first all-talking musicals ever filmed, The Cocoanuts was a challenging production. The Brooklyn Daily Star noted, “It was the first attempt on such a scale to bring over a Broadway musical show to the talking films. Large choruses had to be recorded for sound and picture at the same time. Vast and elaborate sets had to be built overnight and cleared as rapidly.” In spite of it all, the filming was completed in little more than the three weeks Paramount had envisioned. The making of Animal Crackers was an altogether more pleasant experience than was the making of The Cocoanuts. The filming, according to Ryskind, “took place during the coolness of a pleasant spring, there had been a number of technical advances made since our first outing, the boys were much more at ease in front of the camera, and as their stamina wasn’t being taxed by performing another show at night, they were spared the sense of nervous exhaustion that had understandably doubled the intensity of all the other problems that had plagued the filming of The Cocoanuts.” Many of the problems the Marx Brothers encountered at the Astoria studio in 1929 had been solved by 1930. The map in the “Why a Duck?” scene on film is noticeably soaking wet, which was a way to solve the problem of the hidden microphones picking up the sound of Groucho’s handling it and drowning out the dialogue. A year later that was no longer necessary. 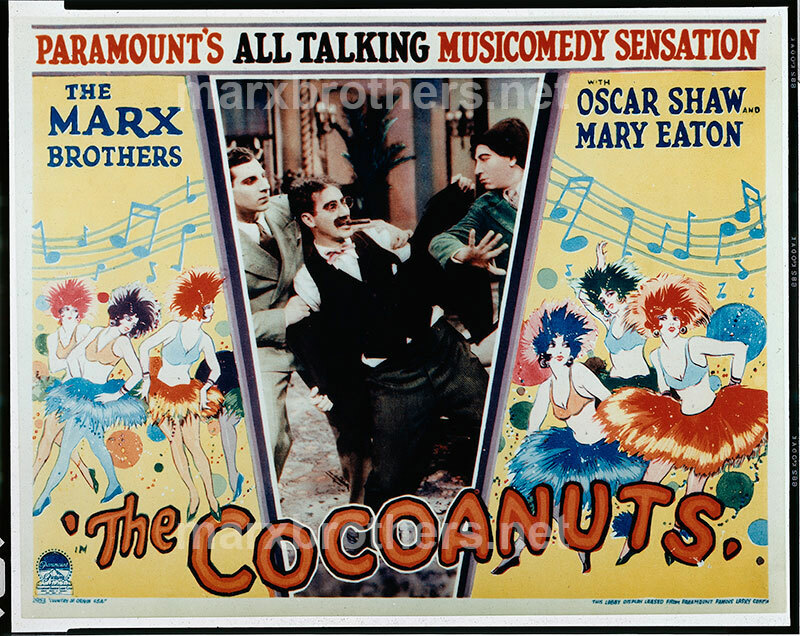 The Marx Brothers’ first two films – both big box office hits – had been made under separate one-picture deals involving Sam Harris, who owned the screen rights to his stage productions of The Cocoanuts and Animal Crackers. With the legitimate theater business suffering financially as a result of talking pictures, the Marx Brothers accurately gauged their future. At a point where they would typically have been preparing for their fourth Broadway show, they decided to forego that step with the production of original motion pictures. Although they made a significant amount of money taking the shows on tour, they must have noticed that with each Broadway show their run got shorter. I’ll Say She Is had 313 performances; The Cocoanuts, 276; and Animal Crackers, 191. All three were hits by any standard, but business on Broadway was severely compromised by talkies. They signed a three-picture contract with Paramount on December 24, 1930. These films would be made in Hollywood and the Marx Brothers relocated in the spring of 1931. They would receive fifty percent of the profits in the new deal. Production of the Marx Brothers’ third film—which would soon be called Monkey Business—was scheduled to begin in April. A large group of writers including S.J. Perelman and Will B. Johnstone ultimately came up with a story that was strikingly similar to the Marxes first major vaudeville success, Home Again. The Four Marx Brothers are stowaways on an ocean liner and during the voyage become involved with gangsters, eventually ending up at a party with them. During the filming, talks were starting with various producers interested in bringing the Marx Brothers back to the stage. They were nervous about material they hadn’t tested in front of audiences and were not convinced they could remain movie stars. Groucho was so concerned about his future in Hollywood that he refused to buy a home there, choosing to rent until he was reasonably certain the Marx Brothers would be able to make a living in the movie business. One Marx brother was sure he wasn’t going to make it in the movies. With Monkey Business on its way to being at least as big a hit as its predecessors, the brothers were relieved of their concerns about finding a stage vehicle that they could turn into their next talkie. The Four Marx Brothers agreed to return to the vaudeville stage for a lucrative tour of the RKO circuit. Vaudeville by this point amounted to little more than live entertainment that accompanied movies. But star attractions like the Four Marx Brothers occasionally elevated vaudeville—and RKO paid dearly for that elevation. The Marxes received $10,500 weekly for the tour, making it easy to understand why Groucho wasn’t so quick to eschew life on the stage for Hollywood. The Marx Brothers had become wealthy working on the stage. Thus far, movies had merely helped them recover from the stock market crash. The Four Marx Brothers had no love for the vaudeville business once they had succeeded without it. They were in it temporarily in early 1932 for purely financial reasons. But they again had reason for concern about their future in Hollywood. There was trouble at Paramount and studio chief B. P. Schulberg was relieved of his duties, as was Jesse Lasky, his mentor and one of the company’s founders. Lasky was blamed for Paramount’s dismal financial position in the early years of the Depression. Actually, founder Adolph Zukor had significantly expanded Paramount’s theater chain, using overvalued company stock to pay the bills. As the Depression worsened, practically everyone in possession of the overvalued stock redeemed their shares, which led the company into receivership by 1933 and bankruptcy by 1935. The studio that had shown eighteen million dollars in profits in 1930 had a fifteen-million-dollar deficit by 1932. The Four Marx Brothers had one of the only participation contracts at this time—a rare case of the stars sharing the profits with the studio. But somehow Paramount wasn’t reporting any profits on Monkey Business, which was a big box-office hit. 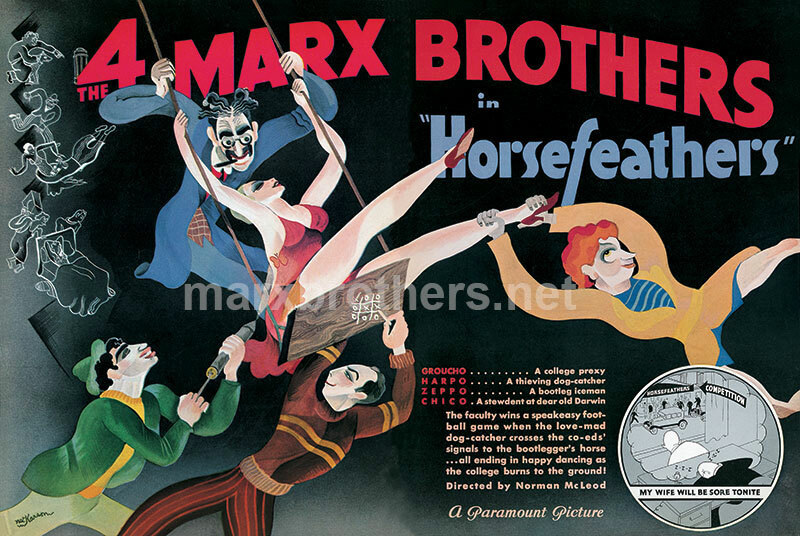 Production would begin on their next film, Horse Feathers as scheduled, but the Marx Brothers were worried about Paramount. cter would evolve from the German schoolteacher of their early acts, “Fun in High School” and “Mr. Green’s Reception” into the president of a college in Horse Feathers. Groucho returns to the classroom for a biology lecture that bears more than a passing similarity to the Marx Brothers’ early schoolroom acts. Students Harpo and Chico were actually past college age when they were students in Mr. Green’s classroom in 1912. By the time they got to college in Horse Feathers, they were in their mid-forties. During filming Chico was involved in a serious automobile accident. Thrown against the steering wheel of his car, Chico suffered a fractured right kneecap and several broken ribs. Production of Horse Feathers was halted for several weeks. A double had to be used for several shots during the football sequence, since Chico was unable to run. Unfortunately the double is several inches taller than Chico and is quite apparent in a few shots. Once Horse Feathers was completed, financially troubled Paramount wanted to get another Marx Brothers picture started as soon as possible. The studio needed another hit and the Marx Brothers were like money in the bank. In December 1932, Paramount announced that Herman Mankiewicz would supervise production of the next Marx Brothers picture. It was tentatively titled Cracked Ice and would be the final film due under their three-picture contract. But the financial problems would not go away. The studio had attempted to reduce the advance on Horse Feathers, requiring the brothers’ agent to speak with Paramount about sticking to the terms of the deal. It was clear that they would be making movies elsewhere soon. 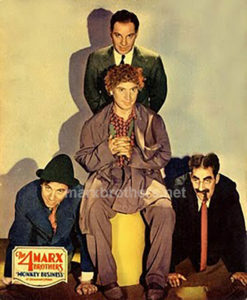 Film Daily reported a rumor that independent producer Sam Katz would sign the Four Marx Brothers after completion of their Paramount contract. During Paramount’s financial reorganization, the Marx Brothers’ contract with Paramount Publix Corporation, along with many other Paramount assets, was transferred to a newly created entity known as Paramount Productions. 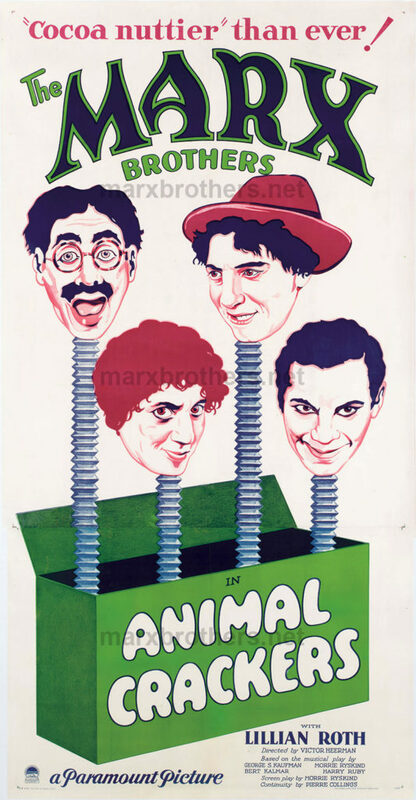 On February 13, 1933, the Four Marx Brothers notified Paramount that they would not make any pictures for the new entity because they felt the studio did not have the right to assign the contract to another company. They were not the only Paramount stars to question the studio’s right to transfer a contract. In March they formed their own company. Their plan was to make pictures on their own and distribute them with Sam Katz. On April 4 Variety reported that the Marx Brothers had signed a five-year deal with Katz’s organization, Producing Artists, Inc. The report said they were set to begin shooting their first film under the agreement in the middle of June. George S. Kaufman and Morrie Ryskind’s 1931 Broadway hit Of Thee I Sing—the first musical to win a Pulitzer Prize—was to be adapted for the screen as the first independent Marx Brothers production. Groucho and Chico were heading to New York to work with Kaufman and Ryskind on the script and also, according to Variety, to “line up material for a show to be done in New York next fall.” They were ready to return to the Broadway stage, which by this point must have seemed far more sensible to them than life in Hollywood. On May 5, Film Daily reported that Sam Katz’s Producing Artists’ productions “will not be announced before next fall owing to current conditions in the industry.” Script work on Of Thee I Sing continued in New York, but there were now concerns about Katz and his financing. In the midst of all of this, Sam “Frenchy” Marx, the beloved father of the Marx Brothers died on May 11. While in New York for Frenchy’s funeral, the brothers learned that the Katz deal had fallen apart, and they signed a one-picture deal with Paramount to film Cracked Ice – which would now be called Duck Soup. Through all the machinations and negotiations that eventually brought the Four Marx Brothers right back where they had been—preparing to shoot their next film at Paramount—there remained one brother who never cast a vote in any of the critical decisions. During the run of The Cocoanuts—at the height of their Broadway success—the Four Marx Brothers were interviewed for a feature story in Collier’s. In the interview Chico said, “We operate like any business partnership. Only three of us vote so far. Zeppo hasn’t graduated yet. We pay him a salary.” Having still not graduated eight years later—by which time he’d been the fourth Marx Brother for sixteen years, or roughly half of his life—Zeppo was probably not expecting his brothers to suddenly grant him a full partnership. Chico, substituting for Louis Sobol in the New York Journal’s Voice of Broadway column, wrote: “Zeppo’s left us to turn honest, but we don’t blame him. He’s gotten some pretty tough breaks. Out on the coast they find it’s hard enough to write funny stuff for three comedians and they can’t think up enough for a fourth.” Zeppo managed to get out of the act before any new movie deal for the Four Marx Brothers could be finalized. Three separate deals to film Of Thee I Sing had fallen apart. When the Marx Brothers went looking for that elusive next deal as a trio they received surprising news. Chico had been negotiating with Paramount and it seemed that the Marx Brothers were likely to make their next picture for their old studio. Emanuel Cohen, the executive put in charge of the studio upon B. P. Schulberg’s firing, was in the process of bringing Paramount back from the brink of financial disaster. He recognized that the Marx Brothers’ pictures had all been box-office successes, and he wanted them back. But he wanted all of them back. Chico was offering a trio, but Cohen figured the established name of the quartet should be carried on. Zeppo might have found this amusing, but Gummo – long removed from show business – would have found Daily Variety’s speculative solution shocking. “Likely that the boys might compromise, in case Zeppo does not want to return to the screen, by injecting their brother Gummo into the acting aggregation.” Negotiations with Paramount quickly broke down. The major problem remained the dispute over the profit participation in Monkey Business and Horse Feathers – which would not be settled until 1962. The Marx Brothers finally found the movie deal that had eluded them since they walked off the Paramount lot in March 1933. Over the course of the eighteen months that followed, they considered several movie options and formed their own production company; the quartet returned to Paramount to make Duck Soup; Zeppo left the team; and they tried to return to the Broadway stage—both as a quartet and a trio. There had been rumors that Fox was interested in the Marx Brothers, but Chico’s next stop was M‑G‑M. Samuel Goldwyn, a friend of Harpo’s had expressed a willingness to make a Marx Brothers picture but also suggested that Irving Thalberg at M‑G‑M would be much better for them. Chico was socially acquainted with Thalberg. Groucho told Thalberg biographer Bob Thomas of a telephone call that he received from Chico. Chico said: “I’ve been playing bridge with Irving Thalberg, and he says he’d like to do some pictures with us. He had to fight with Mayer, who thinks we’re all washed up in pictures, but Irving is firm; he wants us to work with him.” Louis B. Mayer was the head of M‑G‑M, but Thalberg was important enough to have his own production unit within the studio and was able to sign the Marx Brothers over Mayer’s objections. They carried on as a trio and had even greater success in the years immediately following their departure from Paramount. But the first five Marx Brothers films – the ones made for Paramount – are the ones that define them. Their zaniness and anarchy would be heavily diluted at M-G-M as the studio found them a wider audience. Thalberg assured them that love stories injected in the plots would make their films more palatable to female moviegoers. True enough, but the breakneck pace of the Paramount films is gone in favor of scenes that don’t even feature the brothers. Changes in the Marx Brothers’ screen personas would also be immediate and apparent. In Duck Soup, it seems perfectly natural for Harpo to be washing his feet at Edgar Kennedy’s lemonade stand, but in A Night at the Opera, he is violently beaten by his opera star employer for a bit of mild insolence. In the Paramount films there is no pathos. Harpo operates in his own world, untouched by reality. Groucho and Chico can barely figure him out. As the president of Freedonia, Groucho may be a fraud, but he has no trouble getting away with it. In A Night at the Opera he’s a fraud and gets kicked down a flight of stairs when he loses his job. These are not vaudeville’s Marx Brothers. But in the Paramount films they certainly are the Marx Brothers of the stage – the FOUR Marx Brothers, as Minnie intended them to be. While Zeppo may not be as busy as his brothers, they function best as a quartet. 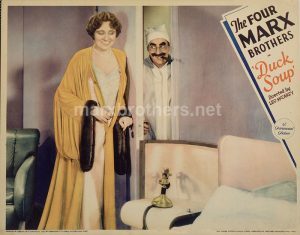 Groucho may have had other capable straight men, but when Zeppo takes a letter to the honorable Charles H. Hoongerdoonger, Marx Brothers fans know he’s the best man for the job. Talkies came of age just in time for the Marx Brothers. In our first look at them in The Cocoanuts, Groucho is almost forty and Harpo and Chico, a couple of years older. The Four Marx Brothers may have been new to the screen, but they were show business veterans when they first went before the cameras. Movie watchers join the act in progress, two decades into their madness. We can only imagine them in their teens and twenties, but the Marx Brothers at Paramount are far from lacking energy. Those five films are one of the last links to the era when vaudeville was the primary form of entertainment in America – and the Four Marx Brothers were packing vaudeville theaters across the country. Of course they were still great as a trio in their later films, but if you want to know what it was like to see them on stage, you need to start with four of them – and their first five films.